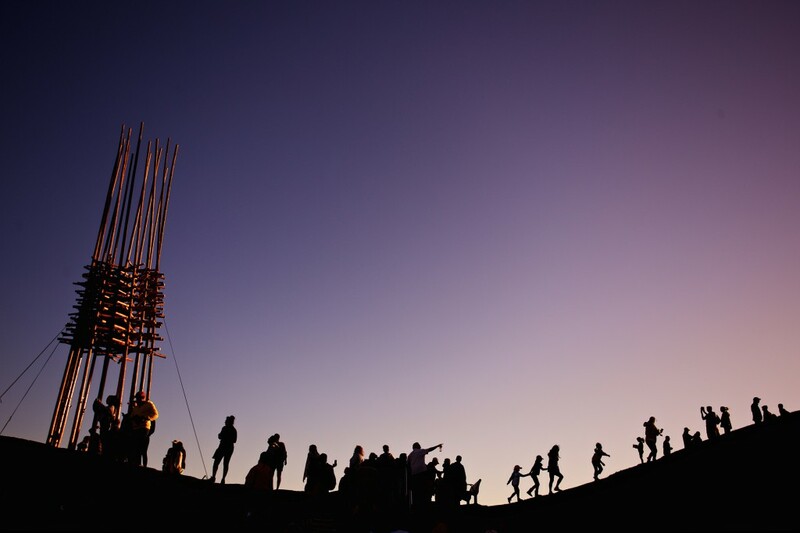 When planning your visit to Sculpture by the Sea, please note that the site is significantly busier and more crowded on Saturdays and Sundays than it is during the week. For people with disabilities we recommend visiting mid week. There is limited access to much of the site and we recommend viewing the sculptures in Marks Park. Tamarama is accessible via a steep ramp to two 1/2 hour accessible parking spaces. The park area is grassed with a pavement along some of the beach. The coastal walk runs from the South end of Bondi Beach to Tamarama Beach, and is connected by various walkways and stairs. 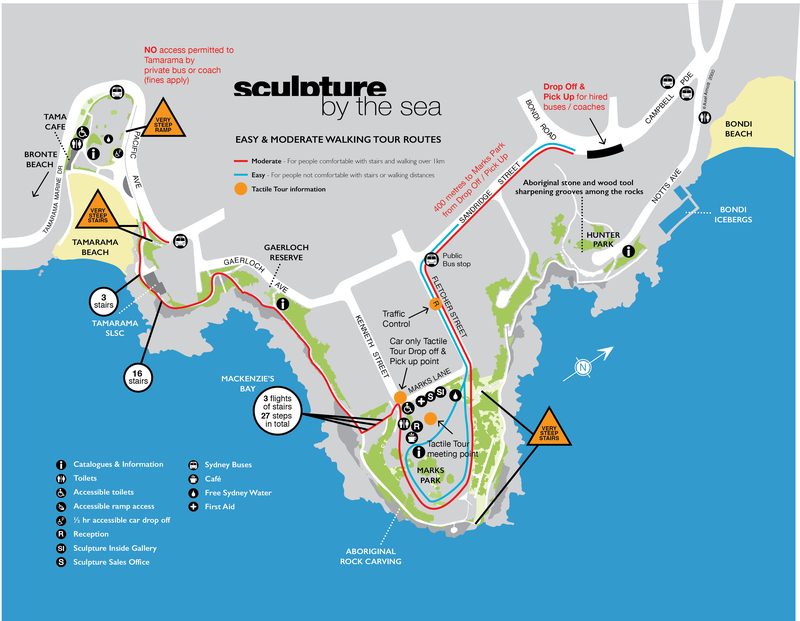 Visitors are advised that there is little wheelchair access along the full length of the sculpture walk and seating along the pathways is also limited. Marks Park provides the best access to a large selection of sculptures, the area is mostly flat and grassed. This area is also the designated drop-off and pick-up zone for visitors requiring accessible entrance to the site. The location of the drop-off area is on the corner of Kenneth Street and Mark’s Lane. Vehicle owners will then have to seek parking elsewhere, where normal parking restrictions will continue to apply. To drop off and pick up at the designated area you will need to display your disability permit to the traffic controller to enter Fletcher Street. Please refer to the Waverley Council map for accessible parking spaces in the area. Due to the popularity of the exhibition, access is restricted to Notts Avenue, Fletcher Street, Kenneth Street and Mark’s Lane from 9am-6pm. Due to limited space in the closed-off streets, we are unable to reserve parking, and as such you may have to drop off your passengers and drive quite some distance to secure a parking. For this reason, we would advise visitors requiring accessible parking to consider visiting the site during the week, as vehicle access can be more difficult during the weekends. We have come up with some suggested easy walking routes whereby you can see almost all of the exhibition while avoiding most of the stairs. The blue route indicates a walking tour specifically for those not comfortable with stairs or walking long distances, focusing on Marks Park, where you will also find the Sculpture Inside gallery which showcases artists’ smaller works, Pop-Up Café and newly installed accessible toilets. The red route indicates a walking tour for those who are comfortable with some stairs, moderate slopes and walking over 1km. You can download the map here. For more information on bus routes and timetables click here. Accessible Toilets can be found at Tamarama Beach, Mark’s Park and Bondi Beach. If you are planning a group tour of the exhibition and require assistance with limited mobility group access, please call the Site Office on +61 2 8399 0233.